A complete single row package including our Float Wheel Direct Drive System. 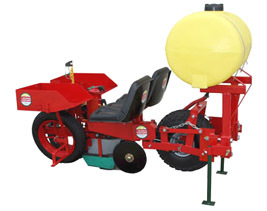 On this Mechanical Transplanter unit, no tank weight bears on the flotation tire. Optional cushion seats and double disc shoes as shown. Adjustable axle eliminates the need for strawberry extensions.UHMW Rollers on all V-3 pockets allow for less friction and longer wear. Available with optional cushion seat, rubber packers and poly double disc opener shoe.